Clever engineering and assembly has produced a functional figure that provides a graphic demonstration of how the human spinal column reacts when heavy objects are lifted correct and incorrectly. 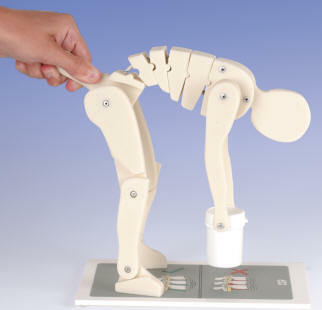 The manikin will lift a weight from either of the two positions marked on the base. If the correct position is used, the spine is undistorted. Use of the incorrect posture vividly demonstrates stress and distortion to the lumbar spine. Anatomical illustrations of the spine are featured on the base. Comes with a booklet containing background information.